Middle School Youth - WELCOME! We are excited to announce that EDGE will be offered as an RE option for middle school youth this coming year. EDGE will move to Sundays, 4:00-5:45 pm starting on Sunday, May 5 th. For those who prefer, we will continue to offer traditional RE classes at 8:45-10:00 am, 4:30-5:45 pm, and 7:30-8:45 pm on Sundays and 7:00-8:15 pm on Wednesdays. We will have informational meetings for parents on Wednesday, April 3 rd at 4:00 pm and 7:00 pm, and on Sunday April 7 th at 9:00 am, 4:45 pm, and 7:30 pm. Please join us at any one of these meeting times. We’re praying for you. Please pray for us in these endeavors. Our Edge Nights are Friday Nights, 7:00-8:30 pm, in the lower level of the Parish Center, unless otherwise noted. 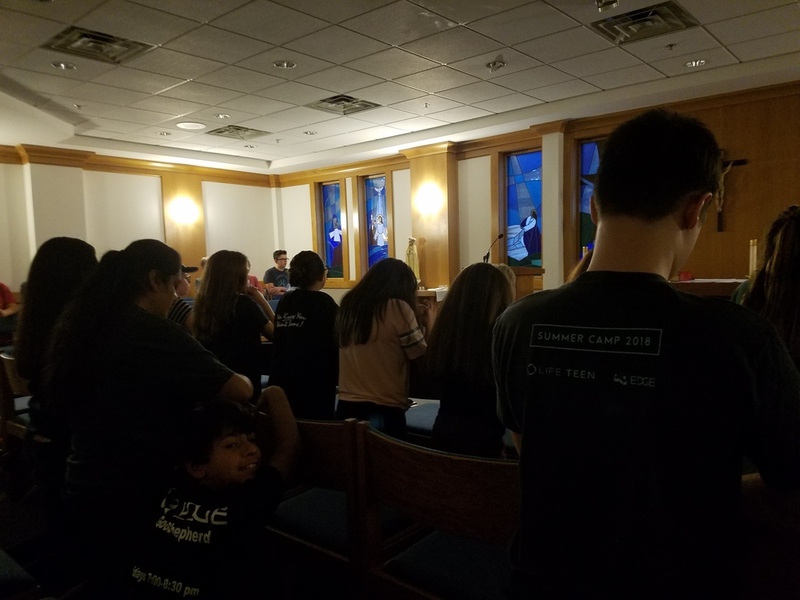 The Edge Nights combine awesome games with engaging catechesis and prayer. We&apos;ll also have some Edge Nights that are just for fun! The Edge Nights are the foundation of our Middle School Youth Ministry. Our Edge Nights will move to Sundays, 4:00-5:45 pm starting on Sunday, May 5th. "Hidden Lake" July 22nd-27th. Cost is $500 ($700 family cap). We will have fundraisers roughly once a month to help you reduce your own cost. Forms are available HERE. We still have some spots available. Turn in your forms and $100 deposit as soon as you can to reserve your spot! All Middle School Youth Are Welcome!!! All Middle School Youth Are Welcome!